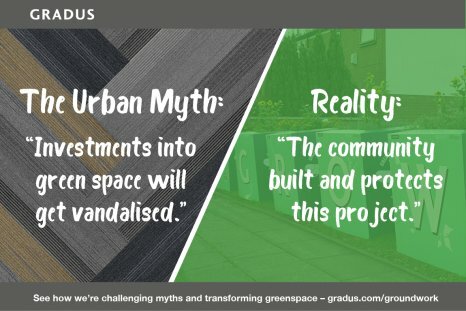 A barrier to urban green space investment is often the belief that it will be vandalised or stolen, which means many project proposals never come to fruition. In our initial discussions with Groundwork, we heard how the community actively protects the projects via volunteer guardians and through the wider connected community. With this in mind, we took to West Gorton in Manchester to plant a Pollinator Garden with the environmental charity, Groundwork UK. We wanted to build a sense of community through the creation of an urban green space. Alongside this, we made it our mission to tackle urban myths following the launch of our premium carpet range of the same name: Urban Myth. Back to the question of vandalism, a study by Forest Research in urban areas found that “through the provision of high-quality green space, crime and vandalism levels have been seen to reduce”. Presumptions that investment in urban green spaces will lead to vandalism is both misguided and unhelpful. It’s yet another urban myth that our project has helped to dispel.